This week’s encounter is The Lost Minotaur, a social encounter with a monster out of its comfort zone. This encounter works best as a random encounter while the party is traveling in a temperate landscape with rolling green fields. If your party is in a snowfield or a desert, however, this encounter can be made to fit any environment as long as it contains a wide, open landscape with few defining features. This off-kilter encounter with a minotaur lost in an open field was inspired by a nonsensical roll on a random encounter table. I hope this encounter gives you the confidence to turn a weird random roll into a fun story. This social encounter is best-suited for 3rd to 5th-level characters. Between the mystical forests and towering mountains of the untamed wilderness are vast fields of green grass, decorated with wildflowers, babbling creeks, and sparse copses of trees. The average adventurer relishes these fields for their wide sightlines and easy terrain, allowing them to spot distant landmarks and cover vast distances on foot without fear of ambush. But for one creature, an open field is not a blessing, but a curse. 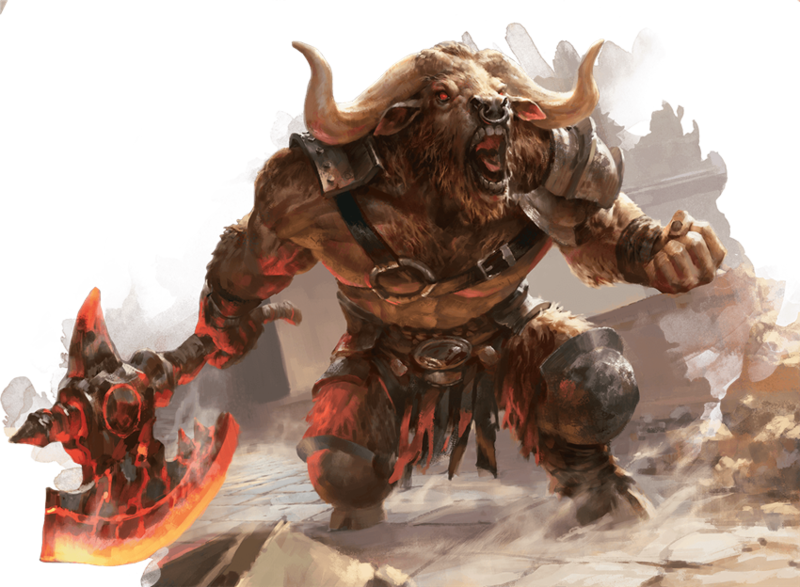 The minotaur, descended from a creature who lived its entire life in a massive, man-made labyrinth, makes its natural home in twisting caves and the maze-like tunnels of the Underdark. And thanks to their innate labyrinthine recall, minotaurs are always able to perfectly remember any path it has traveled by recalling the exact features of the walls, corridors, or roads it has traveled past. It is unthinkable for a minotaur to find itself lost under any circumstances. And yet, this is the exact predicament the minotaur prince Gulgarthos has found himself in: lost in an open field, far from home. 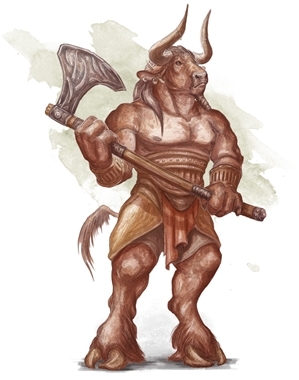 Gulgarthos of Cresheria—known as Gulgar by his friends—is the noble son of minotaur royalty in Cresharia, a small mercantile city-state in the Underdark. 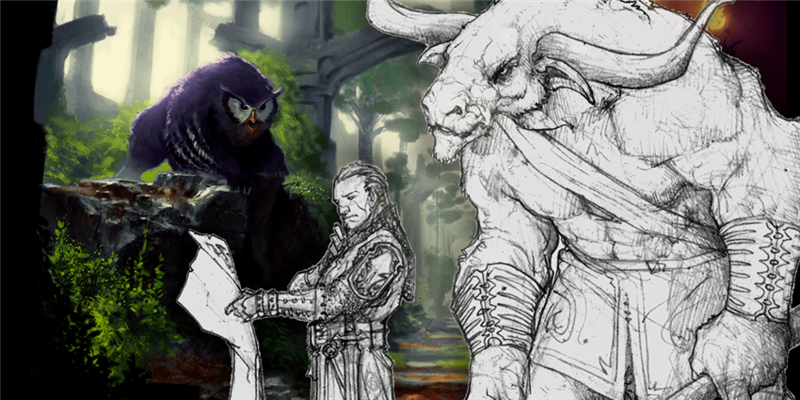 There, minotaurs, duergar, drow, and other beings of the Underdark gather to trade wares and information. The royal family of Cresheria were once cultists of the demon lord Baphomet, but they panicked and fled their grim faith after the incursion of demon lords revealed the true power of their dark lord. They were shown mercy by a group of adventurers battling the demons, and the family of minotaurs have toiled ever since to overturn their monstrous reputation. 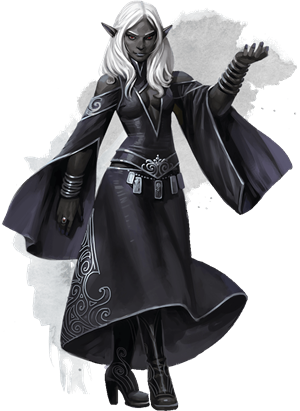 A family of exiled drow are a political rival of Gulgarthos’s family, and the young daughter of that family, a dark elf named Lothira, challenged Gulgar to a duel. The minotaur prince was poised to win, when Lothira used a scroll gifted to her by her elder sister to teleport Gulgar to a faraway land. The minotaur appeared in a field of emerald grass under a blinding sun. Disoriented and confused, the minotaur dashed across the field, frantically searching for a way home—or at least a creature to vent his fury on. That’s when the adventurers showed up. An open field with the sun shining down overhead is a strange place to encounter a raging, charging minotaur, but the life of an adventure is never predictable. The minotaur has been driven into a mad rage by confusion and terror, and attacks on sight. If he can be calmed, he explains that he is the prince of an Underdark city-state and begs the adventurers for help returning him home. Your travels bring you to an open field of green grass that stretches out to the horizon in every direction. The sound of buzzing insects and rustle of grass blowing in the gentle breeze fills the air, and the scent of pollen tickles at your nose. Then, the peace is broken. You hear a roar in the near distance, then see a cloud of dust moving towards you. Within moments, it has drawn within forty feet of you, and you can clearly see a monster with a hairy, humanoid body and a bull’s head charging directly at you! His eyes have not yet adjusted to the bright light of the surface world, and he has disadvantage on all attack rolls for the next 30 minutes. He is in a frothing rage, and has resistance to bludgeoning, piercing, and slashing damage. He is a minotaur of excellent breeding and education, and his Intelligence score is 11 (+0), and he speaks Abyssal, Common, and Undercommon. His alignment is chaotic neutral. On his first turn of combat, Gulgarthos screams in his native language of Abyssal, “I am lost! The sun is so bright!” He then attacks. On the second turn, Gulgarthos roars the same in Undercommon. On his third turn, he pants in exhaustion and shouts the same in Common. 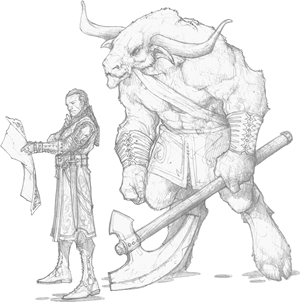 If a character succeeds on a DC 20 Charisma (Persuasion) check to calm the frothing minotaur, Gulgarthos drops his axe and starts crying. If the character fails this check instead, describe how the minotaur can’t hear their words through a haze of rage. If Gulgarthos is knocked unconscious and stabilized, he awakens in 1d6 × 10 minutes with 1 hit point. If calm emotions or similar magic is cast upon him, he makes the saving throw with disadvantage. If he fails this saving throw, his rage subsides and he calmly and carefully asks the characters for help in Common. If the characters calm Gulgarthos and assure him that they aren’t a threat, he explains his story (see above), and asks for their help in getting home. The only wrinkle is that he has no idea where home is in relation to his current location. Regarding Labyrinthine Recall. The minotaur’s Labyrinthine Recall trait allows it to “perfectly recall any path it has traveled,” regardless of environment. Unfortunately, Gulgar was teleported to this field, giving him no chance of finding his way back home on his own. If the characters decide to help Gulgarthos return home, the return journey could take a single session or an entire arc of the campaign. To this end, his home of Cresheria could be a nearby outpost in the Upperdark, taking only a few days of travel and a short incursion into the Underdark to reach. Or it could be many leagues away and deep in the Lowerdark, making the journey a long and dangerous one. Either way, this journey involves some travel with a minotaur unused to the society of the surface world. No matter the length of the journey, Gulgarthos eagerly jumps into any fight to help his traveling companions. He earns a share of the party’s experience, and counts as a 5th-level character. If he gains enough experience to level up, he gains a level in fighter, unless a party member decides to help train him in another class. Gulgarthos is not an unpleasant traveling companion. He has a friendly nature, but it takes him some time to overcome his culture shock. 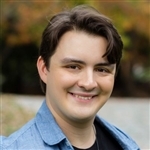 He responds with extreme aggression to small slights, but backs down quickly if a character can calm him down by making a successful DC 10 Charisma (Persuasion) check. Otherwise, he is well-educated in the history and culture of the Underdark. He is also extremely agoraphobic—specifically, he is afraid of open spaces and becomes tense and jumpy in wide-open areas more than 100 feet across. This fear is only exacerbated by the unfamiliar sky and blinding sun above. Other humanoids are made uncomfortable by the presence of a minotaur, and innkeepers may need to be convinced to let him stay by making a successful DC 15 Charisma (Intimidation or Persuasion) check. Inns and taverns are good places to discover rumors that may lead the characters towards the Underdark tunnels where Cresheria is located—especially because there have been drow raiding parties combing the land lately. The characters may encounter drow raiding parties along the road. These are agents of Lothira, the drow princess who teleported Gulgarthos away in the first place. A simple drow raiding party is made up of four drow, and two drow archers. This combat encounter is balanced for a party of 5th-level characters, but can be scaled up to challenge a higher-level party. Her hit points are 49 (11d8). She has mage armor active, consuming one 1st-level spell slot. She has fly active, consuming one 3rd-level spell slot. She has one 6th-level spell slot and knows the 6th-level spell Trobriand’s baleful teleport. If she casts it, she chooses the same open field that she teleported Gulgarthos to before the party met him. She does not know where this location is, but she has studied a gorgeous landscape painting of this open field that her family stole during a surface raid. This location counts as “Seen Casually” for the purposes of this spell. The spell Trobriand’s baleful teleport is a homebrew spell (see below). If you are a player, ask your DM before using this spell. It is not legal for use in D&D Adventurers League games. Lothira cast it from a scroll her elder sister gave her to make Gulgarthos vanish so that their family could take power in Cresheria. She has since continued her studies and learned the spell herself. If Lothira is reduced to half her maximum hit points, she casts greater invisibility and then misty step on the next turn to make a safe getaway. At Higher Levels: If the characters are at least 11th level, Lothira is accompanied by three drow elite warriors instead of drow. These drow elite warriors wear magic items as described in the Monster Manual. This encounter has the potential to spiral out into a lengthy adventure, especially if the characters want to help Gulgarthos reclaim his city of Cresheria from Lothira’s family of drow. This monumental task earns the character a reward equal to a treasure hoard appropriate to their level. However, simply helping the minotaur prince calm down and leading him out of the field he was lost in is enough to merit his thanks, and a reward for each of the characters. After one day of traveling with the characters, Gulgarthos presents them with a brass jingle bell (with the statistics of a stone of good luck (luckstone)) he kept with him as a good luck charm. At Higher Levels: If the characters are at least 11th level, a character attuned to and holding this good luck charm can regain a number of hit points equal to four times their level as an action. Once used, this property can’t be used again until next dawn. Choose one creature or object you can see within 30 feet. If the target is a creature, it must succeed on a Wisdom saving throw or be teleported to a destination you select. If you select an object, it must be able to fit entirely inside a 10-foot cube. The object does not receive a saving throw, but if it being held by a creature, that creature may make a saving throw to prevent the object from being teleported. If you have only seen the destination casually, viewed it once, or heard or read a description of the location, the target has advantage on the saving throw. If the chosen location does not exist, the target automatically succeeds on its saving throw. You can add this homebrew spell to your own campaign by selecting it in the Homebrew Spells section of D&D Beyond. Could you make more of these? I love them. These are the perfect dashes of plot spice to add to a campaign cake. I love the concept for this encounter, strongly considering putting it into my campaign! Do you get any kind of reward for killing the minotaur? Other then experience, I don't think so. Players probably want treasure more than exp. though. It says that the players get treasure appropriate to their level which I think means the random tables in the DMG. So if treasure is more the players speed than best to spare it's life. These are simply amazing! Keep them coming! Really excellent. Just one thing I noticed. "If calm emotions or similar magic is cast upon him, he makes the saving throw with disadvantage. If he fails this saving throw, his rage subsides and he calmly and carefully asks the characters for help in Common." If calm emotions or similar magic is cast upon him, the characters make the check with advantage. If they succeed on the check, Gulgarthos's rage subsides and he calmly and carefully asks the characters for help in Common. No, because a target of Calm Emotions has to make a Charisma save, not the one who casts the spell. This is fantastic! ALL these adventures are fantastic! I would like to request that the next encounter you make be suited for a Waterdeep: Dragon Heist adventure. Wow! This is a great story and could fit into DotMM well, though you would have to bypass the teleportation rules. The Minotaur could also make a great backup PC if a character were to die. I like how the Minotaur gains levels similar to the Unearthed Arcana on sidekicks. Great job James! I think you could start the encounter off with the PCs seeing a large slumped shape in the distance. As they get close they hear crying (passive perception anyone?). And then closer they see it as a minotaur. If the PCs try to attack, because hey they are PCs and you know some will, the minotaur tries to explain his predicament. If the PC continue to press combat and kill the prince then double-down on what they want and have his father send a search party to the surface and either arrive as the prince eats it or the PCs leave enough clues that the rescue party tracks them down and maybe takes them captive and back to dad who wants to teach them a lesson or just kill them. This could surely lead to a new BBEG for the PCs to go after. Likely you would get the luckstone, as it is on him. Hey James, I really like this. It would fit really well into Out of the Abyss. I’m going to keep it in mind fr when my party is ready to go back tot he Underdark. The spell is also interesting... It would be a long shot and a big risk to attempt, but I think the spell could be used to send demon lords back to the Abyss, right? That creates an incentive to find a way to work with Lothira as well as Gulgarthos.